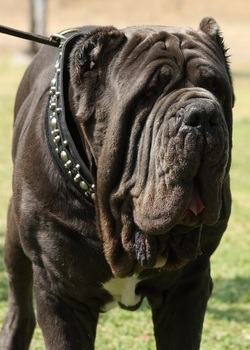 The health problems of the Neapolitan Mastiff are due to two main factors. Firstly the Neo shares the problems of all large breeds- hips, hearts, and heat. Secondly today's Neos are decendants of a small gene pool used in their reconstruction. The heavy rolls of wrinkles on the dogs which are so desirous can sometimes cause problems around the eyes. Entropion, ectropion and Cherry eye is certainly seen in the breed. • Entropion – This is a condition which the eyelids turn/roll inward to the extent that rubbing occurs on the surface of the eyeball with hair. • Ectropion – When the lower lids are loose, causing a drooping of the eyelid's margins, and making the lower lid, turning outward. • Cherry eye – It is VERY common to see cherry eye (nictitans gland prolapsed) on the Neo. The exact cause of cherry eye is not known, however weakness of the connective tissue around the eye is strongly suspected. Procedures improved with ‘tacking' or tucking the gland into place by a veterinarian. Sometimes removal of the gland is the most successful treatment. Bloat is very common in many large breeds. Gastric dilatation-volvulus, or bloat and torsion, are conditions that can strike suddenly and fatally. Bloat is a condition in which there is a rapid accumulation of air in the stomach causing dilatation. Volvulus, or torsion, occurs when the dilated stomach twists on itself, cutting off the oesophagus at one end, and the small intestine at the other. This isolates the stomach and traps air. The very enlarged, twisted stomach puts pressure on the blood vessels, often twisting them in the abdominal cavity, impairing blood flow back to the heart. Because the heart receives an insufficient amount of blood to pump, blood flow to the rest of the body is decreased. With this, there is the fairly acute onset of death of the tissues that are deprived of oxygen, including the stomach wall which rapidly undergoes necrosis. The early signs of bloat and torsion include severe discomfort and pain. The dog paces or repeatedly gets up and lies down again. There is also excessive salivation, panting, and unsuccessful attempts to vomit. Shock follows and often dogs then go into a coma, and death follows. Overexertion, before or after a meal, can lead to bloat, torsion, and death. Owners are advised to feed the dogs presoaked kibble, thereby limiting the swelling of the pellets inside the stomach. Separation from other dogs during feedings is recommended to reduce the Neo's desire to consume the entire bowlful at once. Allergies such as Demodex results in a loss of hair with redness and rash like pimples. If Neo's are kept clean and parasite-free, they do not really have problems with their skin. This seems to happen when the dog lives outdoors in humid or rainy conditions where the ground is often wet. It seems to be a result of bacterial or fungal infections which invade the bottom of the feet between the toes and make them itch. The dog then licks the bottoms of the feet. The licking causes a hot-spot type reaction and the whole process is self-perpetuating. Neo's which live inside most of the time or those which live in dry climates do not get the problem. Canine hip dysplasia is a very common joint disease affecting especially large and giant breeds as the Neo. Mastiffs are not Terriers, so their hips tend to be looser in general. An excellent hip rating is uncommon. Mild to moderate hip dysplasia is an unwelcome but all too common reality in the Neapolitan Mastiff. Large breed puppies take a long time to grow. Throughout the growing process the developing bones are easily damaged with rough play, improper exercise and incorrect nutrition. Excess exercise, at any age, is to be avoided. Rough-housing with a pup, either by children or older dogs, can lead to permanent injury to the hips and elbows. If you think that your dog should go on long runs with you, get a different breed. Most breeders will even recommend against frequent trips up and down the home stair case. Panosteitis can occur in these rapidly growing pups. With a good diet, rest, and time, many pups cease to show symptoms of this "wandering lameness" by their 15th month.